Matt’s father Matthew was a fireman. His mother Margaret died when he was about a year old. Keeping it in the family, Matt’s father married one of his mother’s sisters, Brettie. Matt had no brothers or sisters, though a half-sister Eva came from the union of Matt Sr. and Brettie. She lives in San Antonio today. From the sandlots, Matt progressed through the city’s schools. ”I played when I was at junior high school, I was quite a hitter. I was pretty good size, you know. Everybody that had a ball club wanted me to play. I would have my bicycle and I’d ride my bicycle across town, or any place to play baseball.” The year he started high school, though, the city discontinued its baseball program due to its expense. Unable to play high school ball, he played American Legion ball and in a few other leagues nearby. He was named to the All-State team in Texas for his Legion ball play. ”I played with a semipro team that played around San Antonio, out in the sticks. They would pay you a few bucks, five dollars or something, you know. One of the fellows that used to play with Chicago, Art Veltman, lived there in San Antonio. He is the one that got the team together.” The teams played around the city, not even traveling to nearby San Marcos, but Batts remembers one road trip when a local sportswriter arranged for a truck loaded with hay in the back and drove the team to Del Rio to play a team on the border. He started catching in semipro ball, pretty much by accident, really the result of a little clowning around. “We were beating a team pretty bad and we started changing up, you know, different positions, and I told the catcher I wanted to catch, I wanted to see how it was catching. I picked off a runner at first and threw one out at third. I had always had a great arm. I could throw one from home plate over the left field fence.” It’s something he never tried at Fenway Park. Indeed, he had been offered a $2,500 bonus and a new car -- quite large at the time -- by Red Sox scout Uncle Billy Disch, the University of Texas coach. Veltman, who was a Tigers coach and had wanted to sign Matt, was upset to learn he’d left school and had been beaten out. “He was a great, great, great coach. He was one of the better coaches in the country. He had been after me for some time.” Batts signed in 1942 and was sent to Class-C Canton (Ohio) of the Middle Atlantic League. Batts caught 95 games, batting .294 in 483 at-bats, with 10 home runs and 82 RBIs. Matt enlisted in the Army Air Corps at Randolph Field. He became a crew chief, servicing aircraft, mostly trainer planes for the cadets coming through as prospective pilots. His job was to ensure that everything was in shape with the aircraft, ready to go each morning. He served at Randolph Field for the duration of the war, reaching the rank of sergeant. After he was discharged, the Red Sox sent him to nearby Lynn, Massachusetts, to play in the Class-B New England League in 1946. Despite having lost three years to military service, he improved his production at the higher level of play: he hit .337, drove in 86 runs, and hit 12 homers. As it happened, the catcher for the Red Sox International League affiliate in Toronto, Gene Desautels, got hurt. The club asked Boston for a replacement and was sent Matt Batts. When Desautels got better, the manager put him back in, but the team’s owner laid it on the line: “You get Batts to catching or you’re gone.” Matt told the manager, Elmer Yoter, that he had no idea why, that he’d never met the owner. It wasn’t the only time Toronto’s owner helped out the 24-year-old catcher. “When I was on one of the road trips, my old Chevrolet caught fire and my wife was all scared to death, called me about it. Some people got it put out for her. The owner took my car and had the durn thing all fixed and everything, and paid for it and never charged me a nickel for it.” As to the owner, Peter Campbell, Matt says even today, ”I never have met him.” Matt’s wife Arlene notes that they were so poor at the time they could hardly afford a gallon of gasoline. Late in the season, when Toronto’s season was over (Batts hit .262, with seven homers and 40 RBIs), both he and pitcher Cot Deal were summoned to play with the Red Sox. Batts struck out in his first at-bat, pinch-hitting for Harry Dorish on September 10. The following day, he started both games of the doubleheader against the Indians. He was 2-for-4 in the first game with a double and a home run, and 3-for-3 in the second game, all singles. He made a bit of a splash, hitting .500 in 16 at-bats for manager Joe Cronin. In 1950, Matt got even more work, and improved to .273, but when manager Steve O’Neill came in to take over from McCarthy, it became less enjoyable. “Steve O’Neill didn’t like me for some reason. I thought I was a friend of his, because I knew one of his sons and one of his daughters, you know. Through baseball. When they got him over there, I figured, well, everything’s going to be all right.” It was not. And early in 1951, he was traded to the St. Louis Browns in a complicated deal that saw the Red Sox acquire Les Moss, while sending the Browns $100,000, Batts, Jim Suchecki, and a player to be named later, who proved to be Jim McDonald. It was, Batts remembers, originally meant to be a three-way deal. St. Louis was supposed to trade him on to Detroit, but that didn’t happen until the following February. He had hoped to get more playing time with St. Louis, but was blocked there by Sherm Lollar. He is blunt about playing for the Browns: ”That was the worst place I ever wanted to play.” He admits, though, that he did well, hitting .302 with St. Louis in 1951. And he had a number of experiences to look back on later -- catching Satchel Paige among them. Bill Veeck was the owner and Batts was there for the Eddie Gaedel game. After arriving in Detroit, Batts served as backup to Joe Ginsberg in 1952, struggling with a disappointing .237 average and a paltry 13 RBIs. When Ginsberg was sent to the Indians in an eight-player trade in June 1953, Batts took over as first-string catcher, and boosted his average to .278, hitting six homers and driving in 42 runs in 374 at-bats, the most he ever had in major league ball. On the flip side, he suffered the misfortune of being the catcher in the June 17, 1953 game when the Red Sox scored 17 runs in one inning. But back on August 25, 1952 he’d enjoyed being the backstop for Virgil Trucks’ second no-hitter of the season. 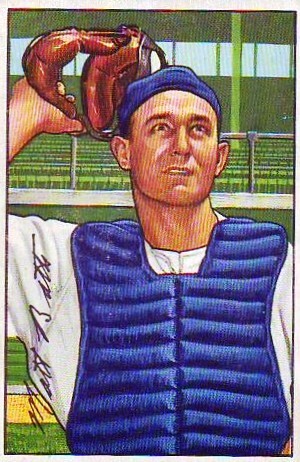 Batts was traded to the White Sox at the end of May, then traded in early December to Baltimore which in turn sold him to Indianapolis in April 1955, before the season began. “I was going to Baltimore with Paul Richards to be his catcher. One practice in spring training, Richards come up with the idea of pitching the ball underhanded in the rundowns, between first and second, second and third, third and home. Well, old dumb-butted me, when the play got to Pesky and I, Richards asked Pesky, ‘How do you like that, Pesk?’ And of course, Pesky was smarter than I was. He said, ‘Oh yes, that’s all right.’ He said, ‘Batts, how’s that with you? Is that all right with you?’ I said, ‘No, I don’t know. They’ve been throwing the ball overhanded for 150 years. Someone’s going to get stung on this game.’ Next day, I was gone.” The Orioles sold him to Indianapolis on April 12. Even with Indianapolis, he hit only .231, though when he got a shot with the Reds in early July when Hobie Landrith was placed on the DL and Cincinnati purchased his contract, he posted a .254 average. His career pretty much just petered out. He spent most of 1956 in the Southern Association playing for Nashville (other than three plate appearances for Cincinnati), hitting .258. He split time in 1957 between Birmingham and -- back where it all began on the gravel streets -- San Antonio. Interviews done by Bill Nowlin on March 5, 2006 and April 26, 2007. 2. Jennifer A. Luna, “Major league catcher Batts loved the game,” San Antonio Express-News, July 17, 2013.